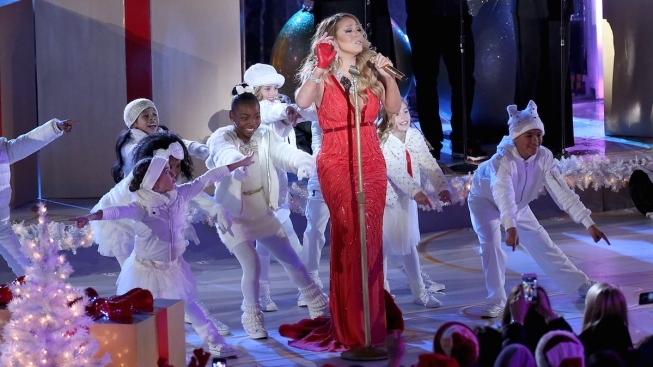 Mariah Carey at Rockefeller Center on December 3, 2014 in New York City. You can try to run, but come this time of year -- there's no escaping the merry-filled sounds of Christmas. It's a joyful conundrum for those of us who can't resist listening to Nat, Bing and Mariah on repeat. Forever. So whether you're pining for a soulful crooner, rocker or diva, we've got you covered through New Year's Day with some of our favorite holiday music playlists. What makes for a good Christmas song? "All the things that make good music," News4's Jim Vance says. "But most of all, passion for the piece." From The Whispers to Ramsey Lewis Trio, hear Vance's holiday playlist here. "I love 'O Holy Night' because it captures the true meaning of Christmas for me," says News4 Today's Eun Yang. Martina McBride's version of the Christmas hymn tops her list of favorites, which also includes Boyz II Men's "Silent Night" and Stevie Wonder's "Someday at Christmas." Listen to Eun's holiday playlist here. If you're looking for the nostalgic classics, modern day standards (and, yes, the '90s boy bands), this is the playlist for you. With more than 100 songs, it's overflowing with yuletide jams to last all night long. So grab a spot under the mistletoe and listen here.